The only animals we saw were a few birds and chipmunks. We had no nighttime visitors and very warm weather. We have more to be nervous about living in Orange County! 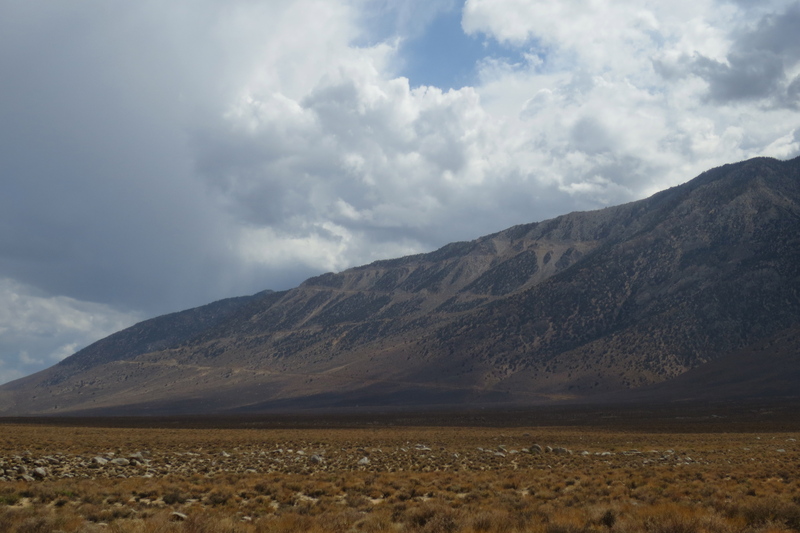 Day One: Our trail commenced from Horseshoe Meadows just south of Lone Pine. 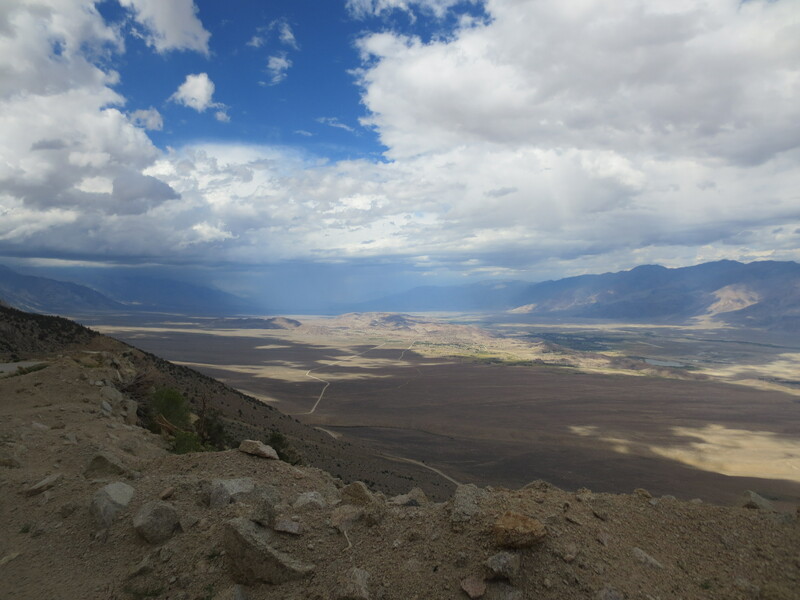 The drive up to Horseshoe meadows has the most spectacular views of the Owens River Valley. A dizzying 5,000 foot ascent worth the detour off the 395 even if you aren’t planning a hike at the top. A couple miles into our trip and just over Trail Pass we were sprinkled with a few drops of rain. The clouds looked harmless so we assumed the drops were just a passing drizzle. Within a few minutes, the drizzle became a downpour. 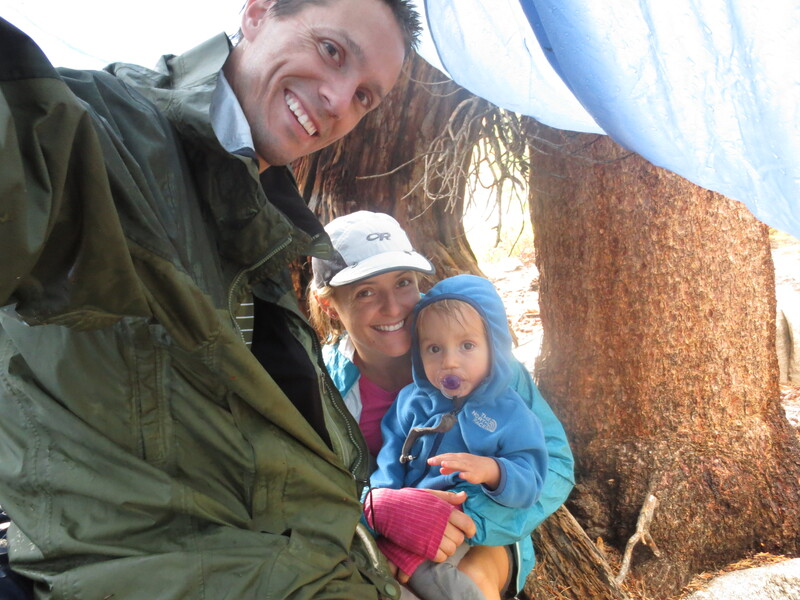 Luckily we found shelter and using our tent’s rain fly Peter engineered a roof for us between two trees and a rock. 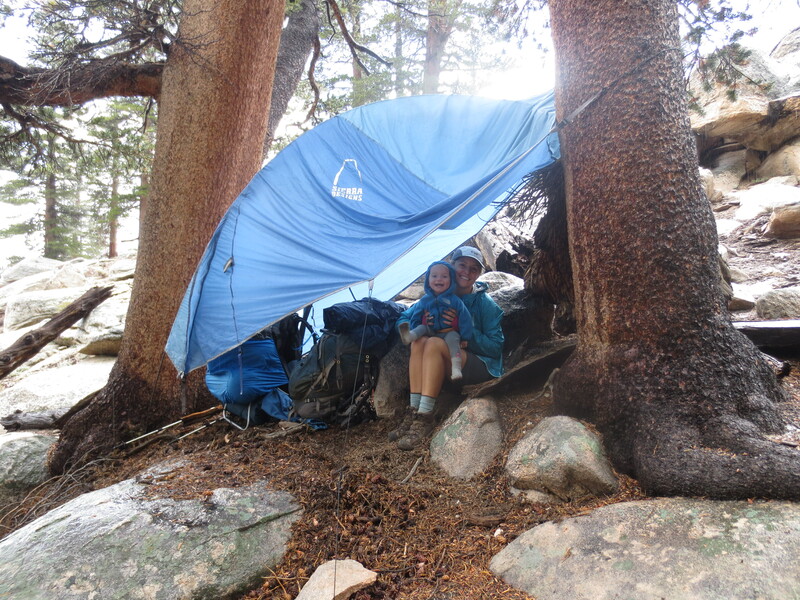 As we crawled in our shelter I imagined the coming minutes, and possibly hours as torturous. Assuming Sage would want to escape the dry shelter to play in the rain, I prepared for a full scale toddler wrestling match. Fortunately I was wrong. She was perfectly content wrapped in my arms and snuggled on my lap. We sang songs and experienced the roaring thunder and flashing lightening, the wonderment of the passing storm. 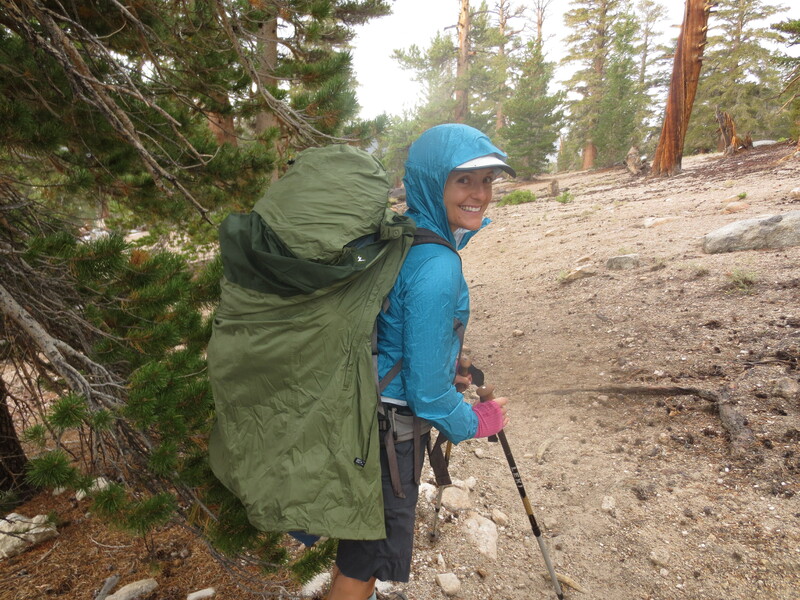 Happy we brought the Deuter rain cover! After about 45 minutes of huddling, the rain passed. We shook off and trudged on. I wasn’t expecting that a powerful mountain rain would bring the most intoxicating forest scents. 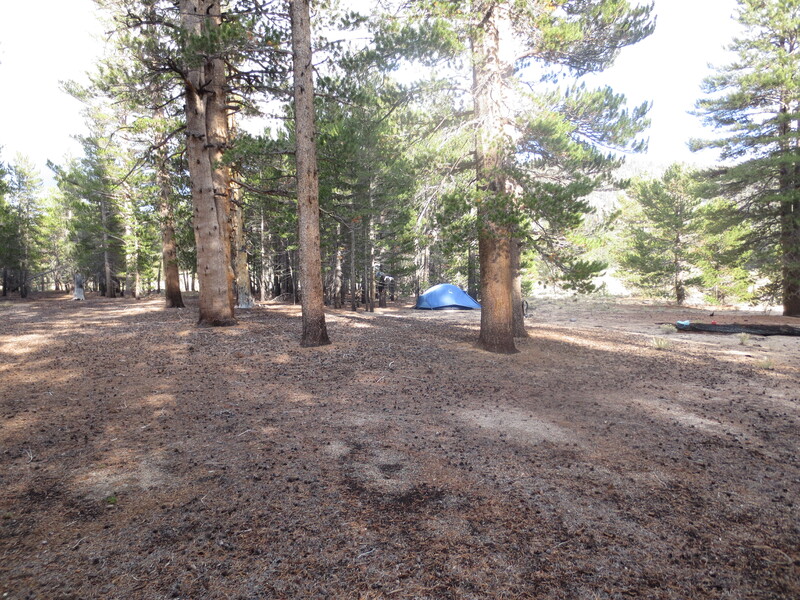 The pine, juniper, onion grass, and sagebrush were fresh and energizing. 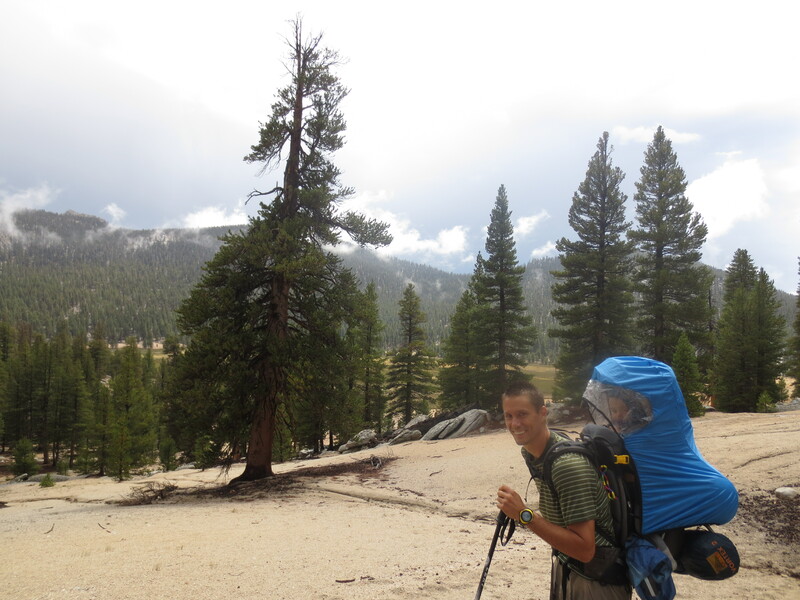 9.7 miles later, upon arriving at our first campsite, we discovered that the heavy rains contaminated our water source. The water was opaque brown so the next 12 hours of filtered water we drank was light brown and tasted like dirt. Our water filter became so clogged that all subsequent pumpings would require a complete upper body workout. 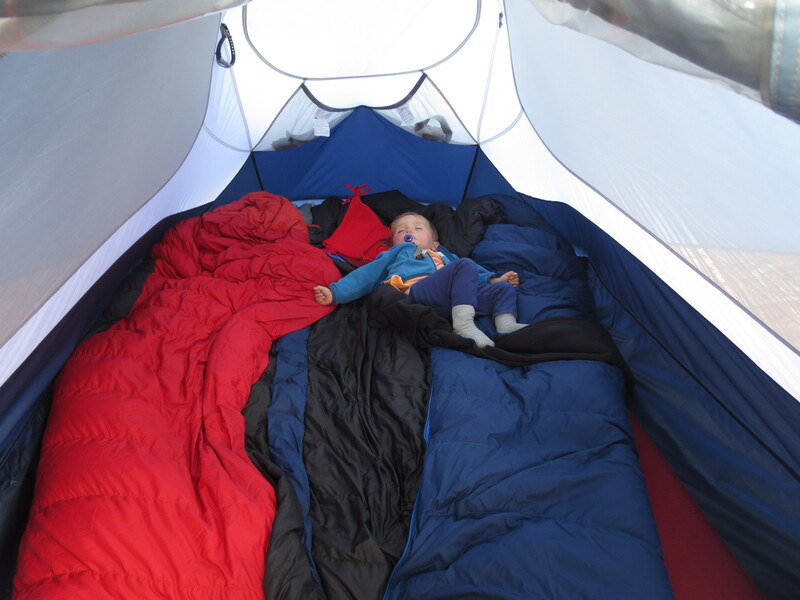 With the exception of dirty water, a melodic coyote howl, and Sage waking up every two hours, our first night was uneventful. My morning cup of coffee made me wonder whether or not Starbucks would consider a shot of dirt on their coffee menu. Maybe the earthy types would go for it? Maybe some mountain minerals are good for your health? I did my best to ignore the dirt and focus on the buzz. Day two started with very sore legs but after some stretching I tried not to think about it. Focusing on how much more weight Peter was carrying reminded me that I had the better end of the deal. 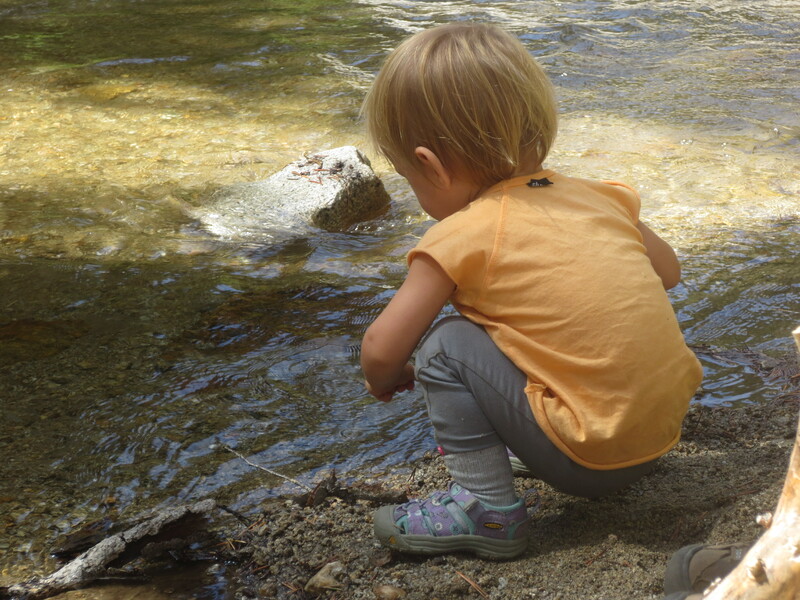 Sage had a marvelous time at one of our break spots putting twigs in the creek and watching them float over and around pebbles until passing under a log and disappearing from sight. 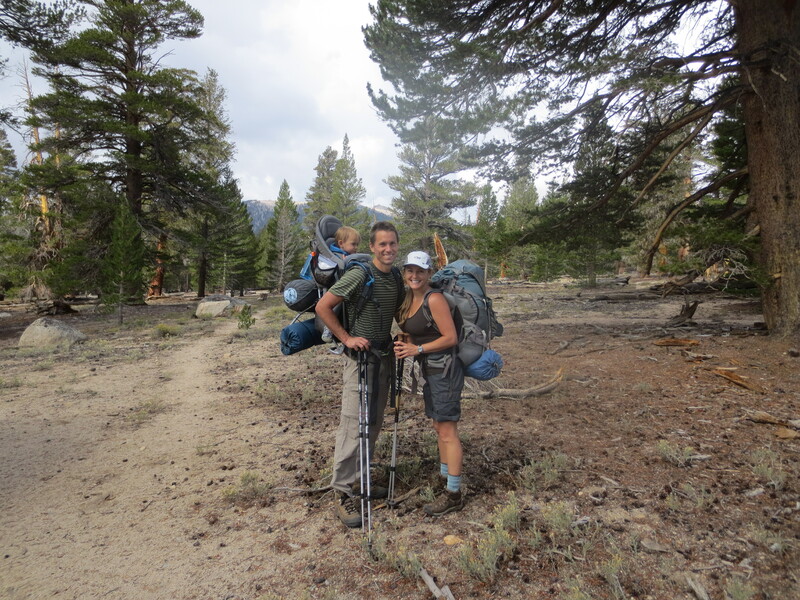 We were heading to the junction below Rocky Basin Lakes with the hopes of finding a campsite in a nearby meadow. 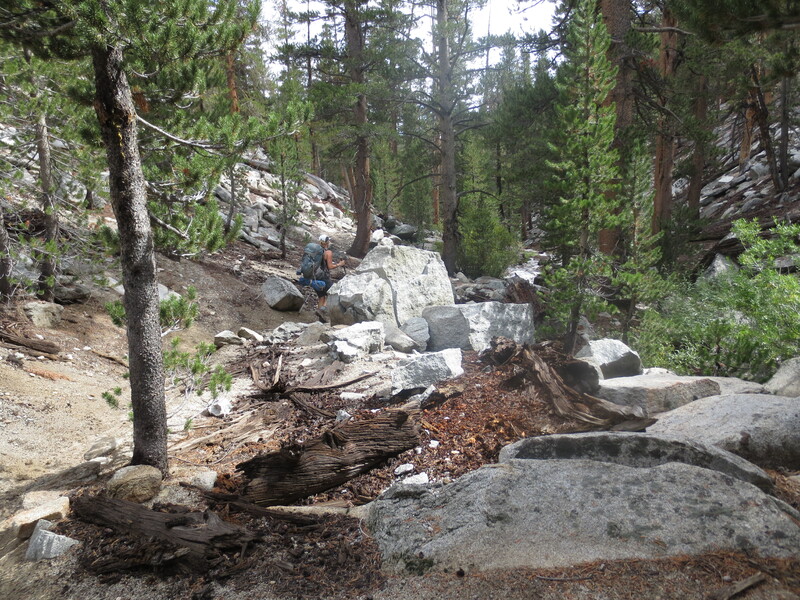 But after realizing the Stringer Stream, fed by the lakes, was mostly dry, we decided to continue on another four miles to Big Whitney Meadow. It was at this junction where we lost our expensive biodegradable wipes. Peter and I (mostly me) made a much bigger deal about this than it was worth. Turns out Sage is a trooper and barely made a peep when future poops were hosed off with the camel back (being held up for extra pressure) our fingers (you do what you have to do!) and dried off with pats from one square of toilet paper. Pretty funny, and pretty easy! 9.3 miles later we finished our second day at the breathtaking Big Whitney meadow with views of the surrounding 14,000 foot peaks. One of the 14ners is Mt. Langley, a peak Peter and I climbed four years earlier when backpacking in this same area. We were happy to find the stream flowing heavily, which provided us with clean water and a soft grassy area to wash up. 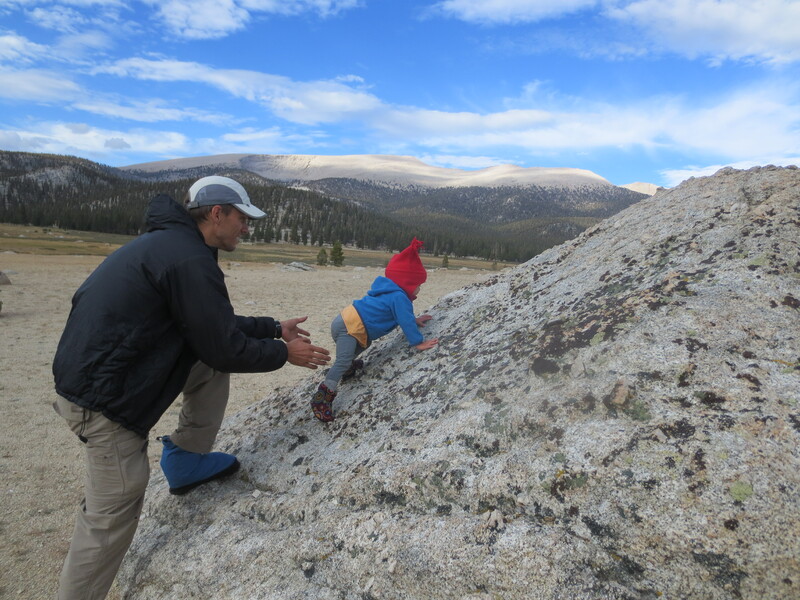 We had a huge and gorgeous campsite to ourselves, and Sage had an endless supply of toddler-sized boulders to climb until dark. Day three and a day ahead of schedule took us up and over Cottonwood pass. 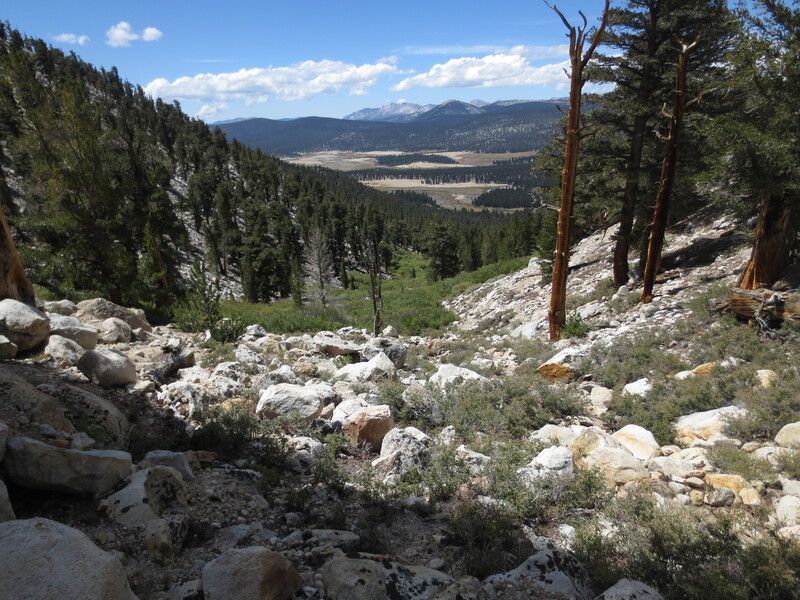 It was a gorgeous climb with spectacular views of Big Whitney Meadow and the mountains that separate The Golden Trout Wilderness from Sequoia National Park. On the ascent we saw the first backpacker in over 24 hours. Upon seeing us with Sage he said, “my 31 year old baby wanted to stay in the city this weekend. You two are lucky!” I felt sorry for him being all alone and having no family members with whom to share his trip. 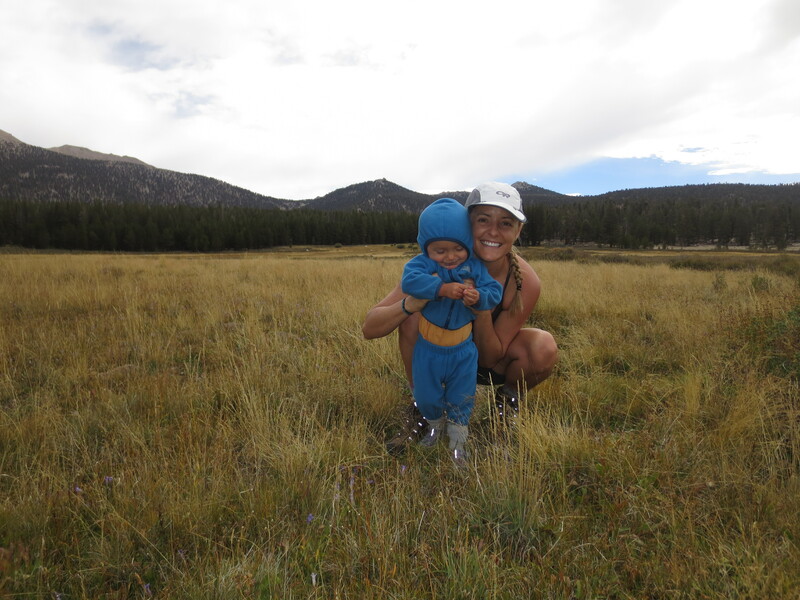 After reaching the top of Cottonwood Pass we decided to hike a bit farther to Chicken Spring Lake. This was another lake we had previously visited on our last backpacking trip in the area. The lake sits at 11,242 feet making it windy and chilly. The temperatures didn’t stop Peter from taking a very vocal dip in the lake. He is brave. That water was icy! 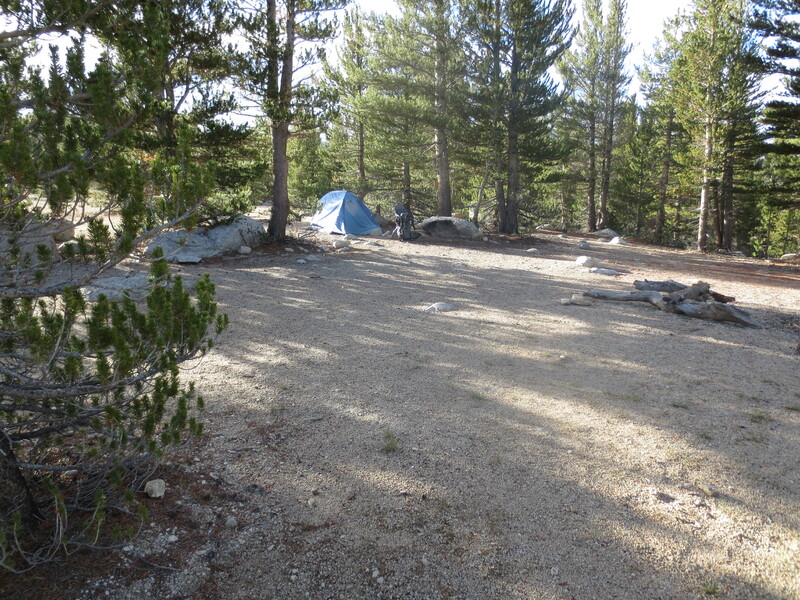 This was Sage’s favorite campsite. 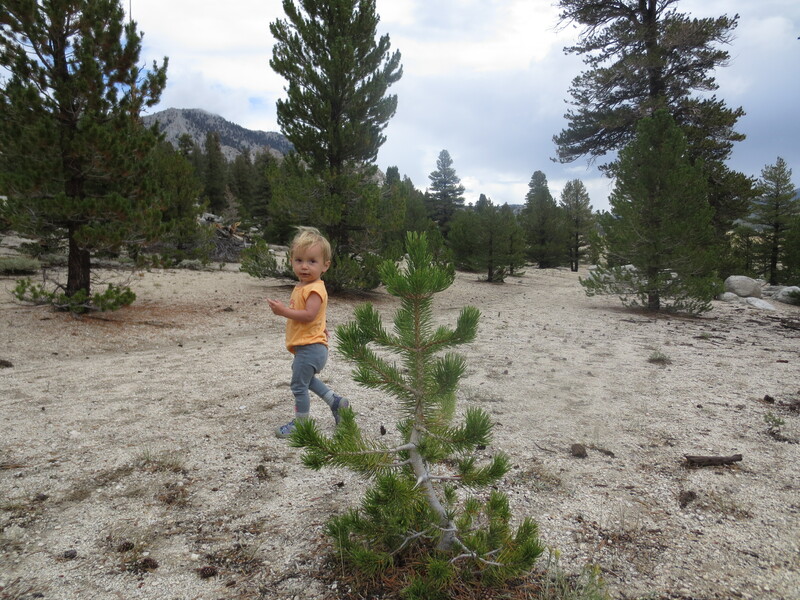 She spent hours throwing rocks into the lake and marching around the perimeter. I was surprised by how willing Sage was to wear her fleece beeny. Since gaining the ability to pull hats off her head, Sage has never kept them on for more than a few seconds. Fortunately, Zealand’s hand-me-down is a new favorite article of clothing. 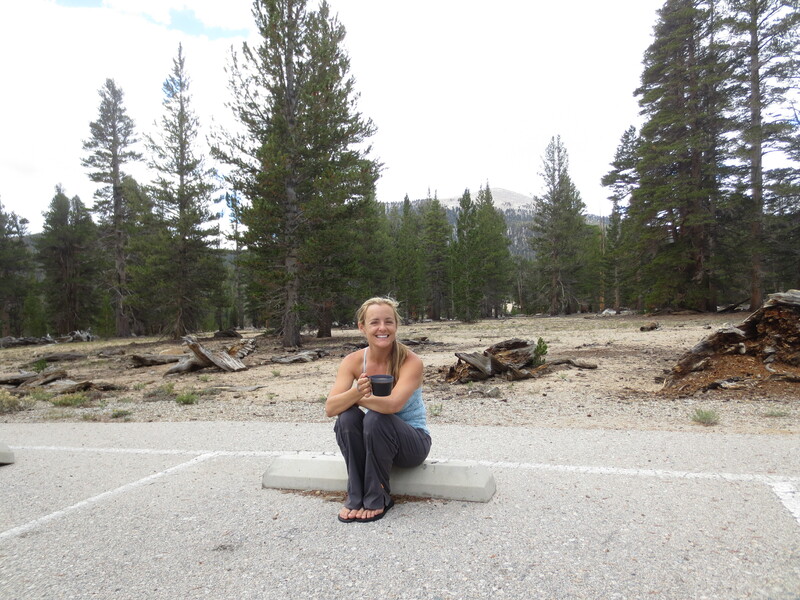 Day four was a quick 5 mile hike back to the parking lot. We cooked the rest of our food for lunch and I got to enjoy a warm and uninterrupted cup of coffee! I am happy I leaned in to some personal discomfort. 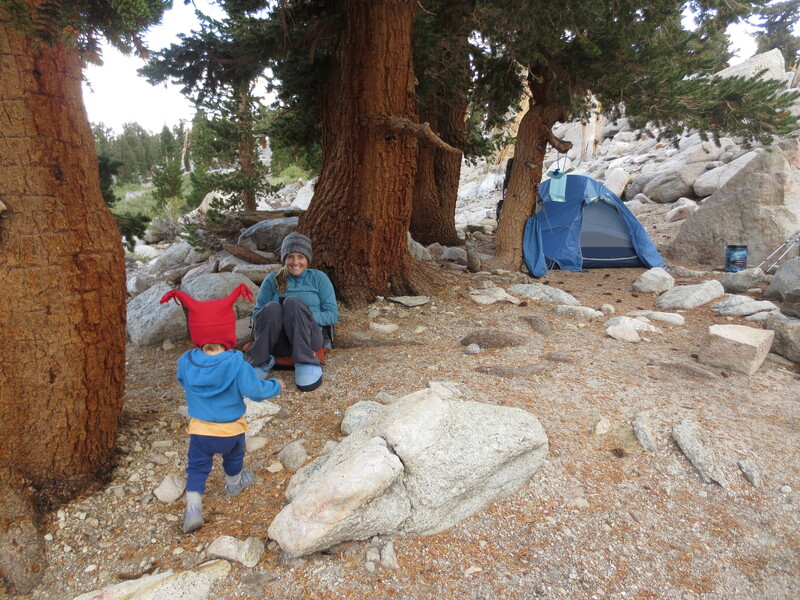 My anxieties about backpacking with a toddler were completely unfounded and were probably caused by too much time away from the mountain life. 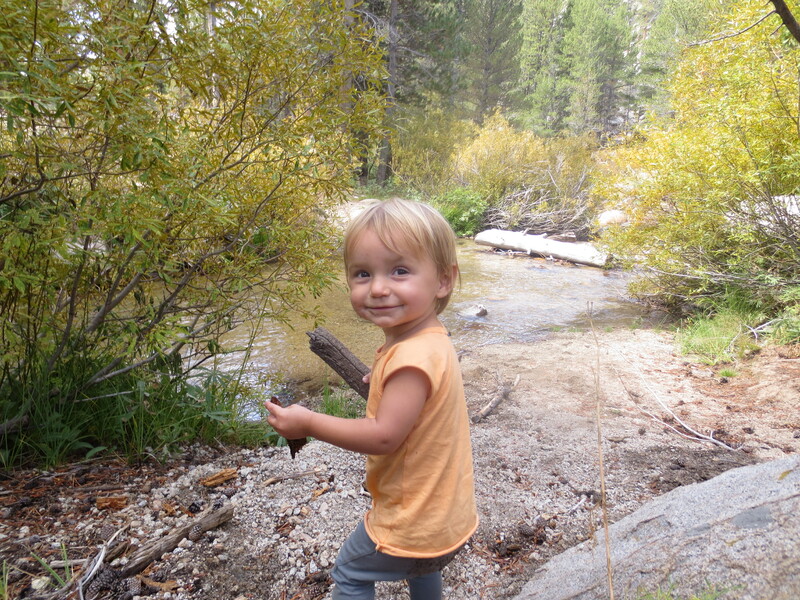 Watching Sage explore the Sierra wilderness without boundaries was joy in it’s purest form. She walked in any direction without fear of stepping off the sidewalk, or picking a neighbor’s flowers. 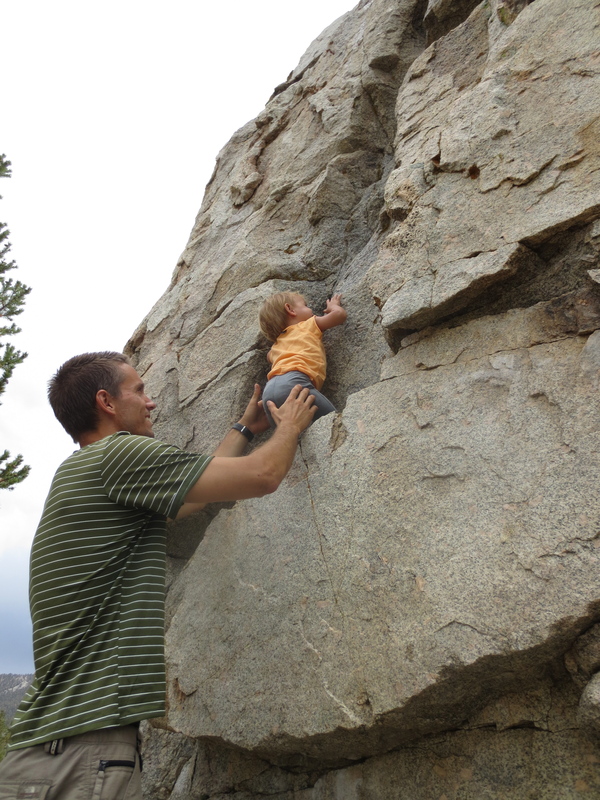 Everything could be touched and smelled, climbed and explored. 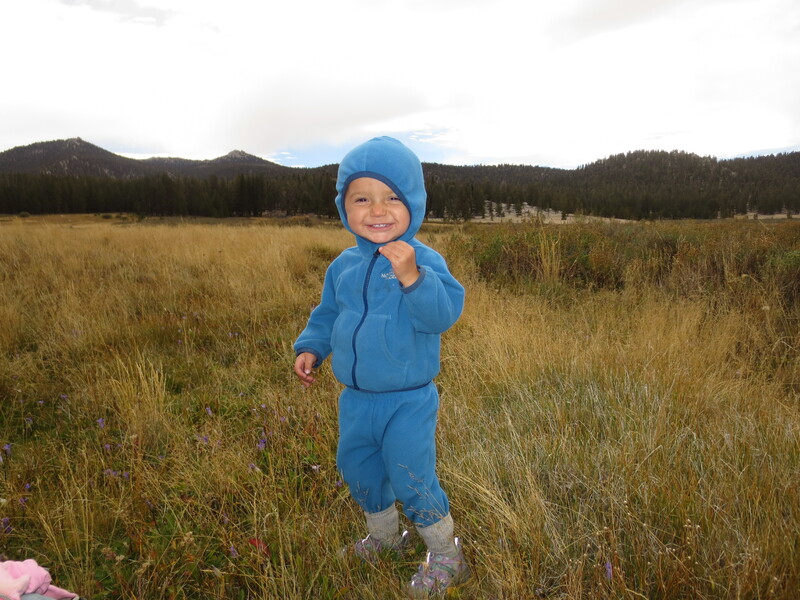 The freedom from toys and artificial entertainment and the reliance on the natural world as stimulation was an experience that must be repeated. 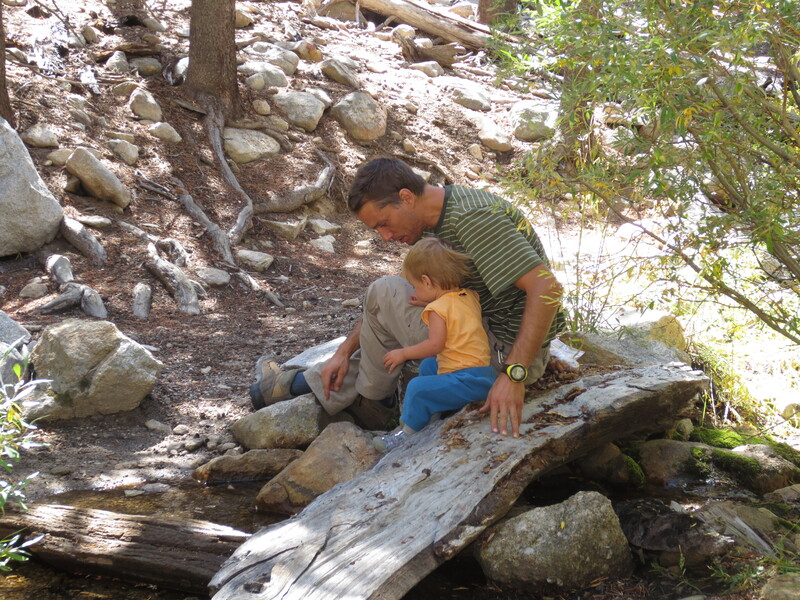 It reminded me of all the opportunities I had as a child to explore the natural world and how much they made a powerful imprint on who I am today. The quiet, simple, and uninterrupted family time made this trip the best vacation we have taken since Sage was born. A new family tradition has begun. Diaper choice and management– We regularly use cloth diapers and had read many blogs suggesting we take these with us. 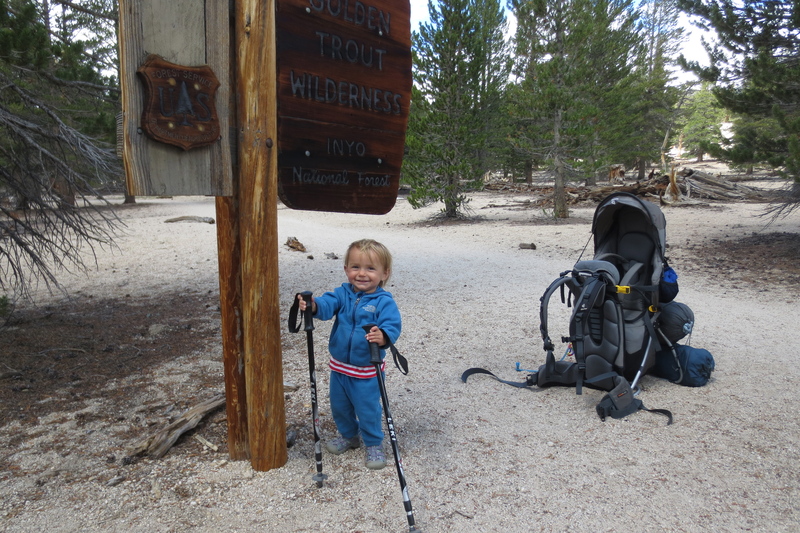 The idea of having to wash the diapers for reuse in the backcountry just didn’t appeal to us so we decided to use disposables. They last longer in between changes and once dried out are actually not that heavy. Wet diapers were hung on the back of our packs or laid in the sun to dry. When there was a poopy diaper the poop was buried and the diaper was rolled up small and put into a ziplock trash bag. The weight really wasn’t too much of a concern. 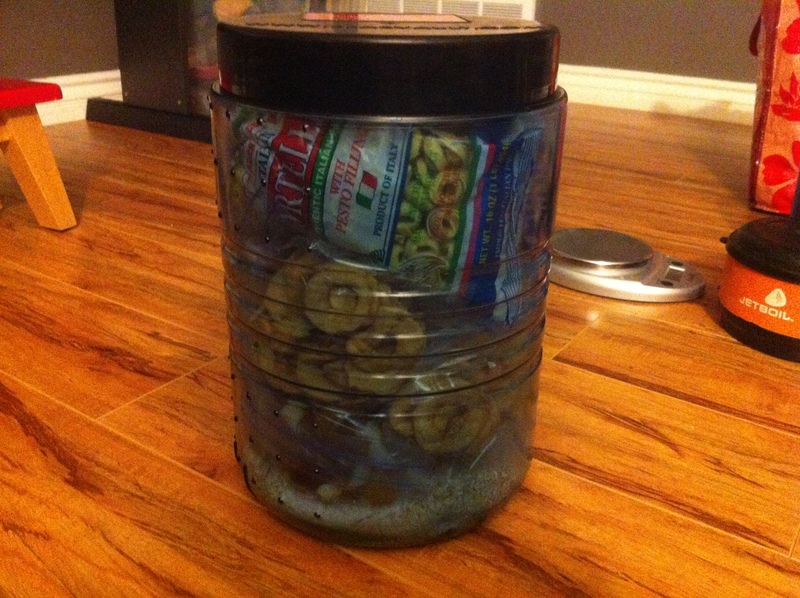 In the end, the final trash bag which was mostly filled with diapers was only 4.5 lbs. I believe we took about 16 diapers averaging about 4 a day which is much less than the 6 or 7 cloth diapers we use a day. 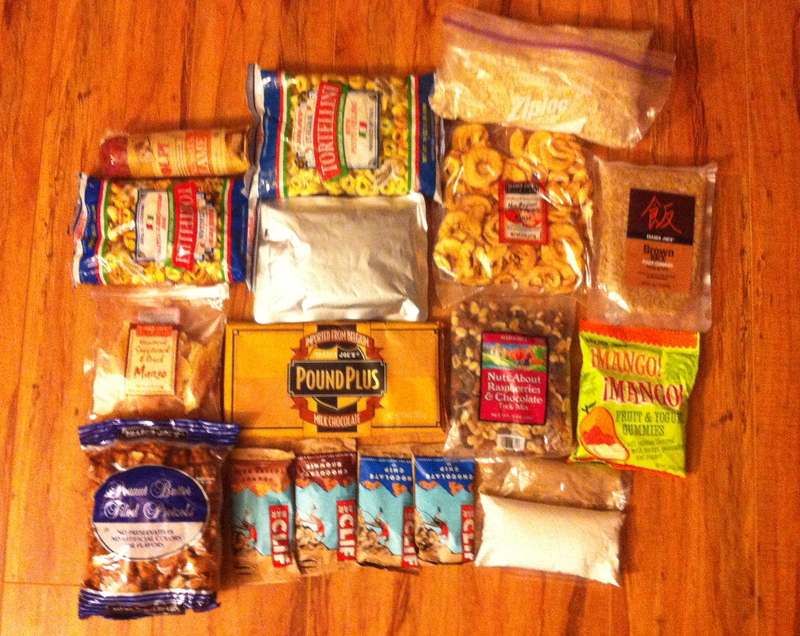 Food choices– We bought all our backpacking food at Trader Joes. We scoured the isles for the lightest yet highest caloric food. All the food needed to fit in our bear canister so it was important that the food we packed didn’t take up too much space. Good new for chocolate lovers: we found that the one pound milk chocolate bar from Trader Joes had the best calorie/weight ratio. Great for snacks for meals! For dinner we ate dried raviolis with olive oil which weighed one pound and provided a ton of calories. Pound for pound, it’s hard to beat pasta. We did one night of indian food and rice which we will not do again. It was too heavy and didn’t provide nearly as many calories as the pasta. 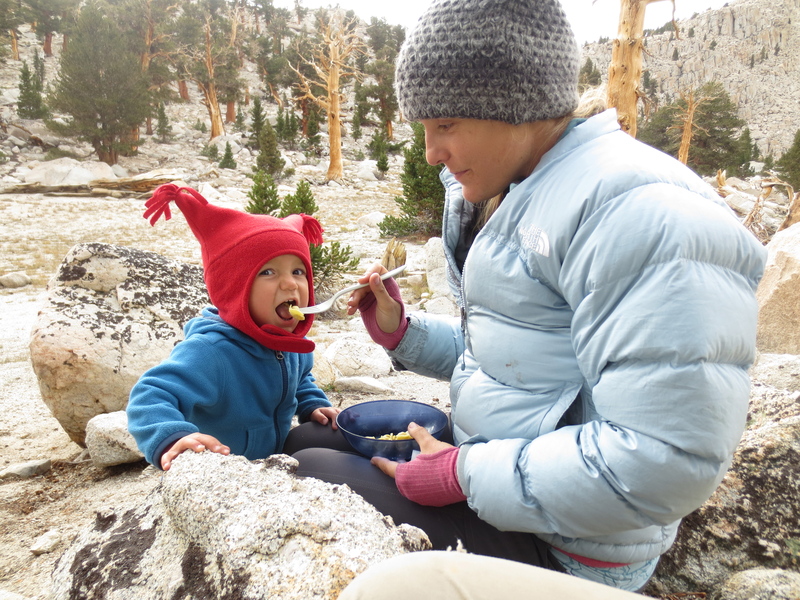 Lunches consisted of cliff bars, salami, trail mix, dried fruit, and a few snacks. Breakfast was instant oatmeal. 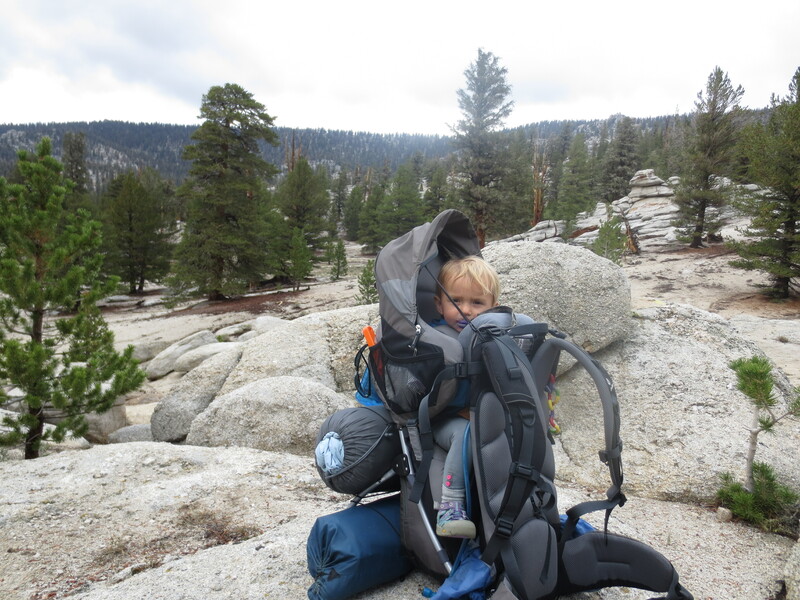 Main Gear– Deuter kid comfort III, Gregory Jade 50, 2 down marmot sleeping bags that zip together, Sierra Design Orian AST, Jetboil Group Cooking System, Pur Hiker water filtration pump, headlamps, bear canister. 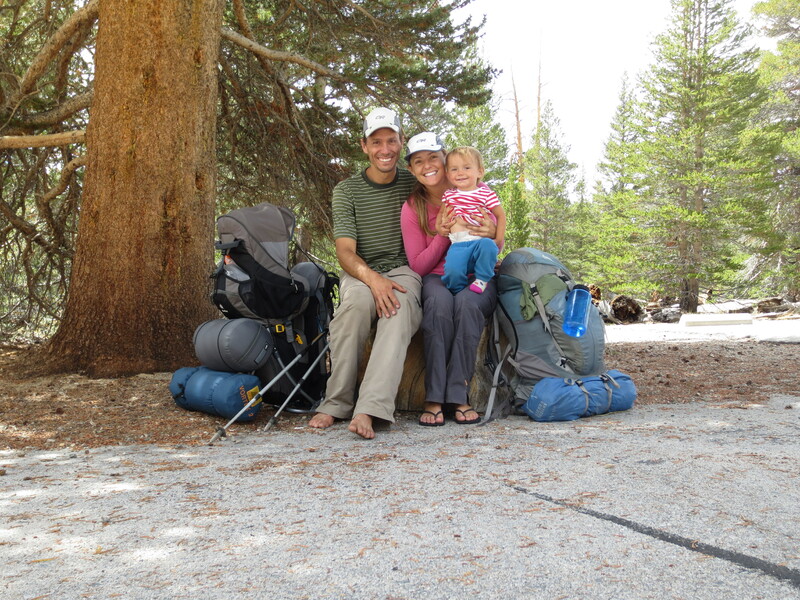 This entry was posted in backpacking, Camping/Outdoors and tagged adventure, backpacking, golden trout wilderness, Sierra Mountains, Toddlers. Bookmark the permalink.